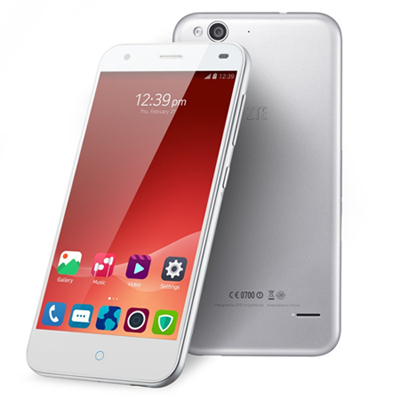 ZTE's Blade S6 measures 5.67 x 2.78 x 0.30 inches and weighs 4.73 ounces. With its clean white front, curved screen edge and rounded corners, the S6 is a good looking device. The circular home button is at the bottom of the display with two additional touch sensitive buttons, the back button and the menu button. When on charge the home button glows blue. On the rear of the device is a small speaker with the headphone jack on the top. Also on the back is the camera with the microSD to the left with the SIM slot. The ZTE Blade S6 has a 5 inch IPS display with excellent viewing angles and true colours. It has a resolution of 720 x 1280 and a pixel density of 294ppi. The 13 megapixel rear camera is a Sony Exmor IMX214 camera with a 28mm wide angle lens and an aperture of f/2.0. It can also shoot full HD video at 30fps. Colours are good with sharp detail in the images. The device features Simple mode together with Auto, HDR, Panorama, Beautify and Smile modes. Images can easily be edited and borders and decorations can be added. The device has a 5 megapixel front camera with a f2.2 aperture, for that all important selfie. The ZTE Blade S6 comes with Android Lollipop v5.0 together with a MiFAVOR 3.0 UI and a 1.5GHz Qualcomm Snapdragon octa-core processor. The device has 2GB RAM and 16GB of built in storage with microSD support up to 64GB. The ZTE Blade S6 is a 4G LTE device which supports dual SIM as standard. The S6 supports dual band Wi-Fi, Bluetooth 4.0 and A-GPS. The device also features Alive Share to allow transfer of files and to play multiplayer games with nearby compatible devices.